Sometimes people ask me if I repeat my messages. I bring the same concepts back but I always write a new message. Why? We learn best through repetition. Me too. We all need these daily reminders in order to move forward. Knowing + Not Doing = Not Knowing! We know many things that are good for us but this doesn’t mean that we are consequent enough to follow through. Excuses are always available. Am I right? Wouldn’t you want to be more in control of your own thought process? The average person has about 60,000 thoughts a day, and 80% of these thoughts tend to be negative if we don’t do anything about it. Negative thoughts are like weeds. They take over everything and that’s why we have to be very strategic. 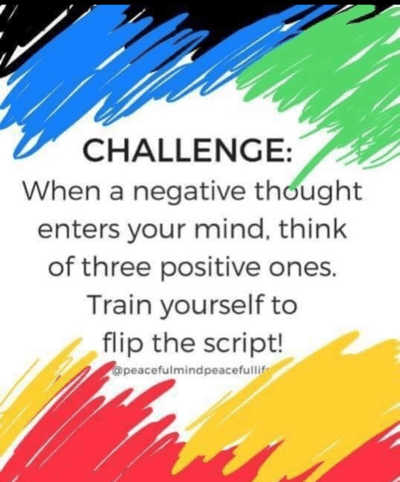 As soon as you catch yourself thinking a negative thought, reframe this thought and think 3 positive ones. This is a super start to develop a more constructive thought process. Many people are not aware that they are not aware. Are you ready to flip that script?